I was born and raised right here in Oklahoma City. I am the youngest and smallest of three boys, which means, at a young age, I had to learn to market and outsell my older brothers, if I wanted anything to go my way. I grew up enjoying art, painting, drawing, crafting, anything involving creativity. After high school, I attended Oklahoma State University studying graphic design, but eventually graduated with a degree in marketing. Not long after graduating, I started working with Tinker Federal Credit Union, and have been enjoying it for over four years now. Q. What led you into marketing? The imagination and inventiveness of marketing has always intrigued me the most, and eventually led me to a career in it. Creativity and design are two things I really enjoy, and I get to use both of them every day as a marketer. It also didn’t hurt that marketing is universally considered the “fun” department, so how could you not be drawn to that? Q, What is your current job and what do you enjoy most about it? Currently, I am a Marketing Projects Coordinator with Tinker Federal Credit Union. I provide creative support to our Business Development team, oversee and develop marketing geared towards our Young Adult age segment, assist with social media and help maintain marketing branding across all our facilities. The most enjoyable part has to be getting to work with such a large, talented group of people who make it fun coming into work every day. The abundance of food is also very nice! There always seems to be treats and goodies in our office. Q. 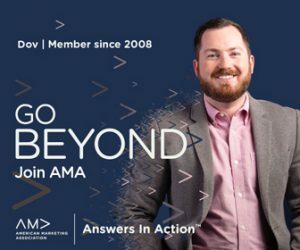 How long have you been a member of AMA and why did you join? I think, officially, I’ve been a member a little over four years, but have been attending the signature speaker luncheons before then. To be quite honest, I joined because everyone else in my department was a member and I didn’t want to be left out. It was also getting paid for, so that was a plus. I keep coming, though, because I love learning new things and staying current with marketing trends and practices. Why do you feel it’s important to stay up-to-date with new practices and tactics in the marketing world and how does it relate to your job? Marketing is just like any other industry. In order to stay relevant and continue to grow, you need to stay up-to-date with new tactics and better ways to reach your audience. As the coordinator for our Young Adult marketing programs, I continue to research new financial technologies, what this age group wants in a financial institution and how we can better provide it. What is the best piece of business advice that you’ve ever been given? This one is hard for me sometimes, and it’s not very inspirational, but “Done is better than perfect.” Sometimes you get too hung up on perfection, and it starts to affect your productivity. Do you have a favorite marketing publication, podcast, conference, etc. that you would recommend? Also, Freakonomics Radio is a great podcast to check out. It helps me rethink how I see problems and find unique ways of solving them. I didn’t lose all of my baby teeth until I was in college.